July | 2012 | Kate Fox. Writer, Broadcaster and Performer: Where There's Muck, There's Bras. Amnesty International asked me to write a poem telling the story of Aung San Suu Kyi for a video animation to be shown to celebrate her recent trip to Britain. It had to tell her story and that of Burma and last no more than two minutes. In the end, the event where the video would have been shown didn’t happen and they got the Burmese comedian and former political prisoner Zarganar to present it to her on a scroll instead. Peter Popham’s book “The Lady and The Peacock” was great source material and contains a reminiscence from one of her former campaign supporters about how everywhere they went, people would read them poems. You can have too many poems. I think the best use of this one would still be to summarise her story to those who don’t know it. as we start with the story of a Burmese man. 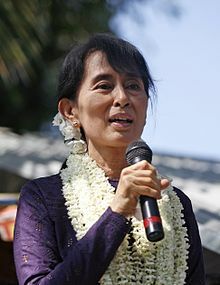 and to Aung San Suu Kyi. in the blood coursing through his daughter’s veins. before his country’s new independence could thrive. How could such a fertile country fail? made things worse in ’62. giving birth, becoming an “Oxford housewife”. while students protested in the face of army attack. the General’s daughter who could never go back. it’s bravery and beauty will surprise. free men were oppressed ones who kept on trying. when her fellow campaigners were dying. said absence of want and fear made people free. catch the light like splintered glass. could still learn and love and laugh. without her two sons by her side. a Bodhisattva, an otherworldly bird of paradise. I’m not the only one who’s had to sacrifice. beyond the captivity it’s call defies. the army imposed a new constitution. until full human rights are won. the interplay of the dark and the light. those monsoon rains will never fail.